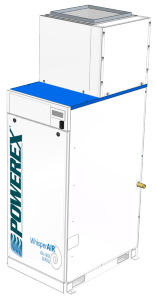 The Heat Manager cooling system removes excess heat from the Enclosed Scroll Compressor Systems to save on air conditioning energy costs and enhance the performance and reliability of the compressor. The cooling fan will operate when any pump inside the enclosure is running. This system can be factory assembled or installed in the field.